The advanced and efficient technology featured in the Vestas 1.8 MW turbines was one of the main reasons a low-elevation wind project in Maine received the green light from First Wind. When it comes to advocating for a wind power project, Dave Fowler, a project developer for Boston-based First Wind, thinks sometimes you just gotta believe. And believe he did in the Bull Hill wind project in Maine, which started operations this past fall, generating enough clean energy to power nearly 18,000 homes. The development of the project in Hancock County, Maine, had an interesting start, with serendipity playing a role. "My brother, who lives nearby, told me about the site," says Fowler, who has worked for First Wind for four years, having originally hired on as a land agent to acquire leases and do easement agreements for wind projects. "My brother knew one of the landowners, who was interested in wind power, and that's basically how it got started." The landowner had been talking with other wind developers but had not signed any kind of agreement. "The landowner gave me the opportunity to talk with him about First Wind and what we're all about, and he decided to go with us," says Fowler. The location seemed to be ideal. "I was really excited about it from a developer's perspective. Bangor Hydro's line was right there, smack in the middle of the area that we were looking at." Discussions about a possible wind power project were held in the community, with wind tests following. "We started to test the wind on the site, but we were a little down on its potential, due to the low elevation," Fowler explained. The site is on the ridges of Bull Hill and Heifer Hill in Hancock County, but it is low elevation, from six hundred to eight hundred feet. "That was definitely something that the First Wind meteorologists were concerned about. At this low elevation, we're looking at 7.2 mps wind." But Fowler believed—so First Wind took a hard look at the site and the wind results. They decided to move ahead with a 34 MW project, using 19 Vestas 1.8 MW turbines, which proved to be key to the success of the project. "We're fortunate in that we've benefited from equipment advances in the industry," says Fowler. "Even four or five years ago, with the technology that was available then, this probably would not have been a viable site. But new technology, the Vestas V-100 turbines, and a 95 meter hub height, made it viable." The Vestas V100-1.8 MW turbine is designed for high energy production from low wind sites, with a greater rotor diameter that enables maximum output at low and medium wind speeds. All of the above said, First Wind still tested the winds for two years, Fowler added, before the project received the green light. Another feature working in Bull Hill's favor is its location to the coast—it's only about 18 miles from the ocean. "Maine is predominantly a northwest wind regime, but we found a very nice southwest summer wind regime that was coming in to the site, that helped things out," says Fowler. While land ownership near major urban centers in Maine can be fragmented, there are some large landowners in the rural areas, such as where Bull Hill was built, that are usually involved in the forest industry. Irving Woodlands, for example, owns more than one million acres in Maine. Until recently, with the dramatic drop in home construction in the U.S. and a resulting drop in the demand for lumber, the forest industry has taken a beating. Are these forest landowners interested in additional revenue to help get through the tough times? "They certainly are," says Fowler. "They might have been skeptical at first, but First Wind has been in Maine long enough now that the majority of landholders realize that wind farms can be a great way to supplement their cash flow and revenue stream on the landbase." A crop of trees takes 25 or 30 years to grow in this part of the country. "When the trees are growing, and there is no revenue, a wind farm could help their business and fund their forest management," says Fowler. 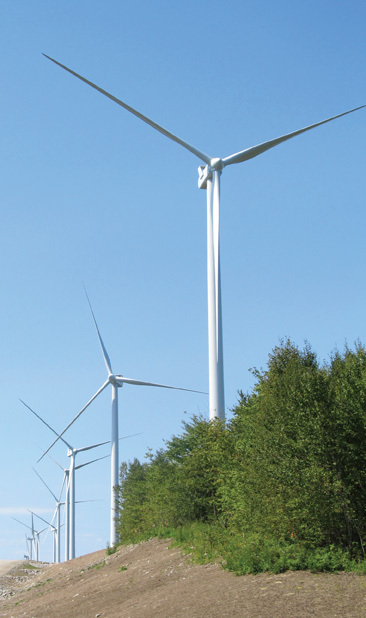 Bull Hill is, in fact, First Wind's fifth wind project in Maine. Combined the projects deliver a total of 219 MW. Though it had four previous projects in Maine under its belt, getting approval for Bull Hill was hardly a slam dunk. "It definitely has not become less complicated," says Fowler, who along with other First Wind employees, shepherded Bull Hill through the approvals process. From a permitting standpoint, he notes, it's always a challenge. "It's never easy. But we have learned a great deal by doing business in Maine. It is still high risk putting a wind project forward because there are no guarantees. But we understand that if we are going to be successful, it is education first. You have to let the community know what you are doing and be completely open. That's going to give you the best chance of success." There are some large landowners in Maine's rural areas, such as where the Bull Hill project was built, that are involved in the forest industry. The forest industry has taken a beating up until the recent recovery of the housing industry and lumber markets, and forest landowners have shown interest in getting additional revenue through leasing their land for wind farms. It's a huge help that First Wind has a good record in the state and is known for working with the communities where it has wind projects, he added. Underlining that is the one-on-one relationship a wind project's representative, such as Fowler, has in a community. "I'm a pretty hands-on guy, and I'm talking with people face-to-face in the local public meetings. I'll spend a lot of time in the community—I'll be there two or three days a week and make sure that people know who I am. If people have questions, I try to make myself as available as possible." Putting that amount of time in over a couple of years adds up to a lot of profile in the community. First Wind's approach is to be plugged into the community and its organizations, including recreational groups. An example: the company hosts the annual Stetson Wind Snowmobile Ride-In in Maine, bringing together snowmobilers to see the company's wind projects up close while enjoying the scenic beauty of the area. This year's ride-in, held in February, gave riders the opportunity to see the company's 57 MW Stetson Wind and the 60 MW Rollins Wind projects while riding along the Ride the Wind snowmobile trail, a proposed 590-mile snowmobile trail that will connect Maine's wind power projects and benefit local tourism and economic development. "A big thing in Maine, and something that isn't available in other parts of the country, is Allowed Use of private property," says Fowler. "Almost every large landowner allows people to have access to their property through snowmobiling and ATV'ing, and we work to encourage that and hold events. You don't want to be alienating the user groups who were there before you came with the wind project." In terms of the construction of Bull Hill, access to the site was fairly straightforward since it was relatively low elevation. Being in a forested area was also a benefit. "The access was great," says Fowler. "That is one thing about the landbase in Maine—with the forestry activity, there is a great network of roads." Some road upgrades were required to transport cranes and heavy wind power components, but Fowler said the road system was very workable. "We only had to do upgrades on two corners on a private logging road to get the components on site. Other than that, we had to move a few signs and traffic lights from Searsport." The coastal town of Searsport was the hub for components. The port has an excellent laydown facility that First Wind utilized. It also has good rail and road connections. The turbine tower sections and the blades came in by ship, and the nacelles, which were manufactured at Vestas' production facility in Colorado, came in by rail to Searsport. They faced some extra work when it came to the tower foundations for Bull Hill. "There was not as much bedrock as we had hoped, so we ended having more spread foundations, rather than rock anchor foundations, which cost extra," explained Fowler. "But that is what it is—you really don't know that part until you carry out detailed geotechnical work on a site." 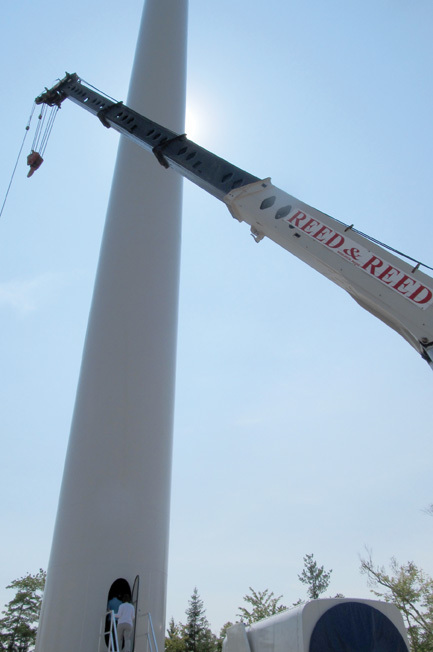 Maine-based Reed & Reed, Inc. was the general contractor on the project. Their project scope included design and construction of foundations, civil infrastructure, underground collector system, grounding, substation, and a bridge. The nearby town of Hancock had a concrete plant they were able to use. As with all First Wind projects, there was a special effort to use local-based businesses and subcontractors. the first BRS (Boom Raising System) from crane maker Manitowoc for their 16000 machine, which allows the crane to reach more than 350 feet in the air. The Boom Raising System for the Manitowoc 16000 Wind is designed to raise longer boom lengths for wind applications, without the need of an assist crane. Without the attachment, Reed & Reed would have been looking at bringing in a larger crane, which might not have been possible given the narrow logging roads. Reed & Reed certainly brought some local knowledge to the project. "But more importantly," says Fowler, "it shows the commitment First Wind has made to hiring local. It's a show of support to the local community and another reason I think we are well accepted because we have made that commitment—and stuck to it." Construction of Bull Hill was completed ahead of schedule in mid-November. Power is now being delivered to utility NSTAR under a long term power purchase agreement, helping the utility meet its commitment to provide renewable energy. During construction, Fowler said they did not feel they were under time pressure, with the then-expiry of the Production Tax Credit looming at the end of December. "You never know when something can trip you up, but everything went pretty much the way we thought it was going to go. Nothing came along that made us too nervous, that made us think we might miss the PTC deadline. I'm more concerned about the next project." The 19 Vestas 1.8 MW wind turbines on the Bull Hill project sit on 95 meter tall towers, making them the tallest wind turbines in New England. Construction of Bull Hill was completed ahead of schedule in mid-November, and power is now being delivered to utility NSTAR under a long term power purchase agreement. The next project for Fowler and First Wind (now under construction) is 50 MW Hancock Wind. Only a mile from Bull Hill, Hancock Wind shares the same collection substation. As with Bull Hill, there were some visual concerns, says Fowler. "But because this is a low visual site, the only feedback I've got back in the community has been about night lights. We've agreed that if and when the FAA approves it, we would install radar." Going into last fall and toward the end of 2012, there was a fair bit of limbo in the wind power industry, with the uncertainty around whether the PTC was going to be extended. Fowler said that it was pretty much business as usual, though. "You have to find the balance and not be too bullish. But it's my job as a developer to be as bullish as possible on my projects and try to convince the First Wind executive team and board that I can hit my targets." lined up for 2013 and beyond. The company has said it hopes to increase its operating portfolio of wind projects by 50 percent or more with the extension of the federal tax credits by Congress. First Wind currently operates 980 MW of wind projects in six states, including Maine. The company is looking at several additional projects in Maine, along with possible projects in Oregon, Washington, Idaho, Utah, and Hawaii. With the wind power industry going at full throttle the last few years—with a record amount of wind power coming on line in 2012—many of the premium wind power sites have been snapped up and utilized. But less than ideal sites can also work for wind farms. Fowler believes that (as with the Bull Hill project) wind turbine technology is going to continue to advance and essentially make sites that were not viable, quite workable. "I firmly believe it is going to continue to advance to the point where it is going to open up even more potential wind power sites that weren't viable five or ten years ago." This can really help the industry, he noted, especially related to transmission capacity, which has emerged as a major issue. "Given that transmission is one of the more fixed components of the industry, if we can continue to find more locations that work, even if they are at lower elevations—and they are more proximate to existing transmission—that has got to help move projects forward." These wind sites also might face less resistance from local communities, notes Fowler, due to their less than high profile locations. "I know it's important in Maine—and it's probably just as true elsewhere—that a site like Bull Hill was very well accepted in that it wasn't as visual as wind projects sites that are located at a ridgetop, for example, where the ridgetop is a prominent visual feature in an area. With Bull Hill, it was a lower elevation site, so it blends in more, and is more acceptable. "The visual is always going to be an issue with some people, but without question, it was less of an issue with Bull Hill than it has been with our other projects."